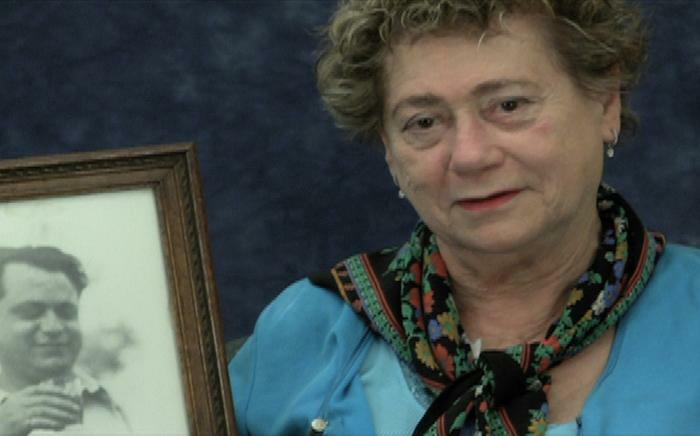 Still image from Eva K. Holocaust testimony, October 31, 2010. SynopsisEva K was born in Budapest, Hungary on August 1, 1934. She discusses her family. She recalls her father being taken to a labour camp in 1941. She recalls the German invasion in 1944 and anti-Jewish regulations such as having to wear a yellow star. She describes moving to a building designated for Jews with exemptions arranged by an uncle. She describes hiding during round-ups. She recalls liberation by Soviet troops. She describes her mother’s remarriage. She recalls attending school. Eva describes fleeing to Austria during the Hungarian revolution and receiving assistance from the Red Cross. Eva describes moving to Brazil and later to Canada. She discusses her career as a designer and artist. She describes returning to Hungary. Eva shows photographs.